﻿ Best Price on Cabinas 3 Rios in Ojochal + Reviews! 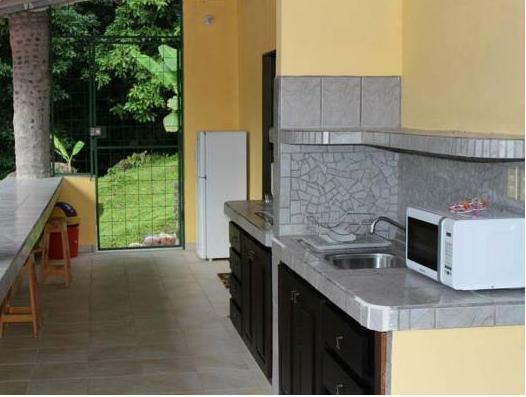 Cabinas 3 Ríos is a property surrounded by the Costa Rican forest. It has an outdoor pool, extensive gardens and terraces with hammocks. Free Wi-Fi access and private parking are available. The spacious chalet is equipped with air conditioning, kitchenette with fridge, hob and microwave and a small dining area for 4 guests. The bathroom offers free toiletries. Guests staying at Cabinas 3 Ríos can order their meals through the room services offered on site from a local restaurant. Other restaurant options can be found within a 10-minute drive. The property can contact the guest with local touristic agencies so to arrange outings and tour trips. Ventanas Beach is 15 minutes’ drive from Cabinas 3 Ríos and Marino Ballena National Park is 10 km away. Playa Ballena Domestic Airport is reachable after an 8-minute drive. Please note that the first night of the reservation must be paid in advance. Once a booking has been made, Cabinas 3 Rios will contact the guest directly to arrange payment by bank transfer or Paypal. Please note, the swimming pool is currently closed for maintenance. Please inform Hotel 3 Rios in advance of your expected arrival time. You can use the Special Requests box when booking, or contact the property directly with the contact details provided in your confirmation. Payment before arrival via bank transfer is required. The property will contact you after you book to provide instructions.